There are many different types of candle wax available and this can be hard for the beginner to understand. I will list the different wax and tell you what they are best used for. A soft wax with a low melting point, it is perfect to fill all your container candles. Also used for carved candles and making modeling. This is a quality hard wax, with a high melting point and a variety of uses. Perfect for your general candle making, votives, tapers, molded and embedded candles. A less expensive candle wax, yet high quality molding and taper wax. This paraffin wax has a melt point of 152 degrees. Primarily used for molded candles, hand-dipped tapers, and floating candles. A beautiful natural wax collected from beehives. 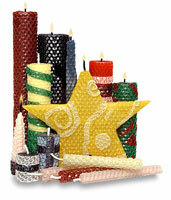 Beeswax candles are popular for their pleasant hint of natural fragrance and extended burn time. Beeswax sheets are available in both naural and a variety of dyed colors. The honeycomb pattern adds a chic natural look, and a cluster of these honeycomb rolled candles make a stylish and unique accent to your home. If you have any questions or candle wax ideas please contact me and I will add it to my site.